"Little tart shells with a rich pecan and toffee filling make beautiful desserts for the holidays or any special occasion." Heat oven to 425 degrees F. Coat 12 (4 x 3/4-inch) tart pans with no-stick cooking spray. Beat shortening and cream cheese in large bowl with electric mixer on medium speed until fluffy. Beat in flour and salt until dough forms. Divide dough evenly into 12 pieces. Pat evenly into prepared tart pans or roll each into 5-inch circle between 2 small sheets wax paper and line prepared tart pans. Trim dough even with edges of pans. Place tart pans on baking sheet. Bake 5 minutes. Whisk sweetened condensed milk, egg and vanilla in medium bowl until smooth. Stir in pecans and toffee bits. Divide evenly into crusts. Reduce oven to 375 degrees F. Bake tarts 17 to 20 minutes or until lightly browned. Cool completely. Remove from pans. 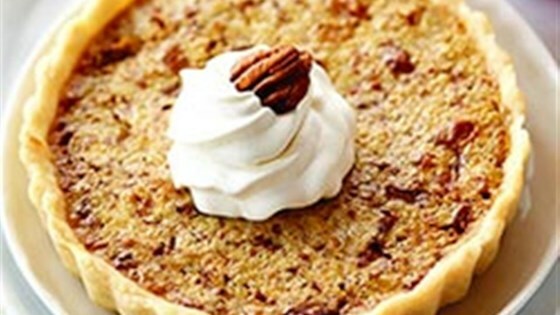 Garnish with whipped cream and pecans halves, if desired.